LIMITED EDITION GOLD PLATED STAMP ON FIRST DAY COVER. COVER IS NEW IN BOX. THE COVER WAS PRODUCED BY AUSTRALIA POST AND HAVE THE AUTHENTIC MERCHANDISE STICKER ON THE BACK. THE COVER COMES IN A PLASTIC ENVELOPE AND BOX. MARK ON STAMP IS ONLY A REFLECTION IN THE PHOTO AND NOT ON THE STAMP. 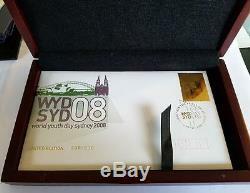 The item "2008 WORLD YOUTH DAY LIMITED EDITION GOLD PLATED STAMP FIRST DAY COVER IN BOX" is in sale since Thursday, July 27, 2017. This item is in the category "Stamps\Australia\By Type\Covers\Australian Decimal".8" and is located in Melbourne, Victoria. This item can be shipped worldwide.